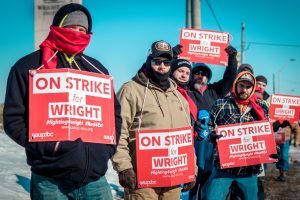 As the Wright State faculty strike enters its third week, the university says it will hire long-term adjuncts to fill in for WSU faculty union (AAUP-WSU) members currently on strike. “Wright State has begun posting advertisements for long-term adjuncts as the union’s strike continues. We are looking forward to bringing in more, qualified instructors to provide instruction to our students as we move forward,” university spokesman Seth Bauguess said in a statement. The university has advertised positions for fields including STEM, Liberal Arts, and Business on The Chronicle of Higher Education’s website. Bauguess was unable to say how many long-term adjuncts positions the university has advertised. AAUP-WSU representatives say they do not take the job postings seriously. The university’s announcement follows previous statements claiming that all classes would be covered during a strike. On the first day of the strike, the university claimed that about 80 percent of all classes were covered “without issue,” according to Office of Communications. In some cases, classes have been placed on hold until March or cancelled altogether, according to department chairs. Students in specialized fields, such as Motion Pictures, have been given alternative assignments while their professors are on strike. Assignments have included taking tours of the university library and attending guest speaker presentations, students have told The Guardian. In the meantime, the university has encouraged students to meet with their department chairs and advisors. University Provost Susan Edwards announced that the university will hold advising sessions in the Student Union Atrium this Thursday from 3:30 to 9 p.m. and Friday from 8 a.m. to 5 p.m.
“Students should know we are working hard to prevent disruptions from continuing. We ask them to please contact their department chairs to report any further class schedule disruptions,” University President Cheryl Schrader said. Bauguess said that more AAUP-WSU members have returned to the classroom in the past week. 273 of the union’s roughly 560 members are currently teaching, according to Bauguess. “The actions of those faculty members who continue to participate in the union’s strike do not change the university’s obligations to its students, the taxpayers and our community to continue operating the university,” Bauguess said. Since day one of this semester, 246 students have dropped out of Wright State as of Thursday, Feb. 7, according to Craig This, director of Institutional Research and Analytics. That indicates a 1.8% difference from the number of students enrolled at the beginning of the semester to now. Students of the School of Medicine remain unaffected by the strike, as none of their professors are represented by AAUP-WSU. The deadline for students to withdraw from courses without a grade and receive a 100 percent refund is Friday, Feb. 8.